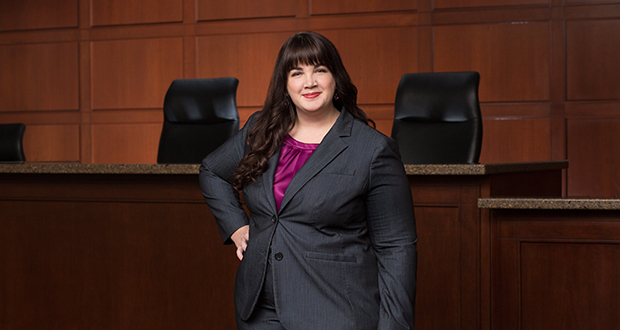 Robins Kaplan associate Alyssa Lawson says being a “risk evaluator” is an important part of her complex technology litigation practice representing Fortune 500 and technology companies in Minnesota and nationally. That approach stems in part from her experience helping her late husband during his 18-month battle with cancer. He passed away in December 2015. Lawson, who had previously practiced in Silicon Valley, had just joined Robins Kaplan in Minneapolis when her husband was diagnosed with lymphoma. Lawson since has poured additional energy into helping junior associates and women technologists advance. Within the firm, she sits on the mentoring and diversity committees. She also volunteers with the Leukemia and Lymphoma Society and sits on the board of Women Leading in Technology. A. Probably because of what I went through, I don’t like small talk. It’s the client I want to talk about. Are we doing everything right to serve our clients? Is there something we can do better? Otherwise I am always happy to talk about my pets. I have rescued four cats and a dog but no I’m not a crazy cat woman! A. I have degrees in political science and philosophy and worked in politics in Madison while in school. I contemplated getting a Ph.D. in philosophy but decided I wanted to do something that was more of a practical application of my studies. I wanted to be able to effect change in the world, not just read about it. A. I always have a collection of short stories by my bedside, usually horror or fantasy like H.P. Lovecraft or Neil Gaiman. I like to be able to get through an entire story before I go to sleep. A. People who don’t acknowledge another person’s time. I always ask my colleagues when I go into their office or my clients when I call them up if they have the time to talk before I launch into anything. A. I like that I’m able to be creative. As an IP litigator, I am able to craft persuasive arguments and come up with common analogies to explain complex technology to a layperson or create presentations or pictures that can explain hard concepts in a simple-to-understand manner. A. Wasted time, wasted money spent on arguments and disputes that could be solved by just getting on the phone and working out a deal. A. I love going to listen to live music. I have seen over 500 bands live in concert. I will make the time to go to concerts because music is really important to me. A. Eau Claire, Wisconsin, is well-known for its music scene. I would take people to watch live music or visit the microbreweries in town. A. Judge Ronald Whyte [U.S. District Court for the Northern District of California in San Jose]. I externed for him when I was third-year law student at Berkeley. He was a thoughtful, intelligent and kind judge that gave everybody their day in court. A. That it’s always fast-paced and glamorous. Patent cases could go on for years, and we could spend months arguing about the definition of a word. In one of my current cases we are actually arguing over the definition of “the.” Actually, maybe that’s exactly what people think working as an attorney is like!